A wine both complex with layered flavors but also refreshing in its crisp acidity. Melon & mango flavors with a hint of honey and toasty oak. Vibrant pale straw color with a light golden hue. On the nose, it is packed with tropical notes of melon and mango, with just a touch of honey and toasty oak enveloping the fruit. 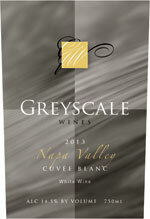 A rich layered wine, picking up vibrant fruit flavors as it carries through the palate. The latter part of the palate is quite refreshing as the crisp acidity carries the long finish through and keeps the fruit flavors persistent.